The ancestors of the chickens raised for food are jungle fowl (Gallus gallus). These birds can still be found in their native Southeast Asia, where they live in social groups and spend their days foraging for food, caring for their young and roosting in trees. Their potential lifespan is 15 years. Domestic chickens destined for the dinner plate are subjected to a very different, much shorter life. Since there are so many birds in so little space, attention to their individual needs is impossible; administration of food and water is automated, and there is scant veterinary care, so sick or injured birds die and their bodies are simply trampled into the litter. Once at the slaughterhouse, the birds are yanked from their crates and, while fully conscious, they are hung upside-down in shackles and their throats are slit. They bleed to death. Chicken is hardly healthy food. In addition to exposing the body to large amounts of harmful substances such as cholesterol, saturated fats, and concentrated protein, chicken consumption can also cause food poisoning. Since the outbreak of BSE (Mad Cow disease) in Israel and Western Europe, cattle can no longer be given feeds that contain meat, fish, or chicken meal. Farmers, however, are allowed to give chickens these feeds. In Israel, the Agriculture Ministry prohibits the use of antibiotic growth promoters (AGP). In spite of this regulation, chickens are fed antibiotics, but "a week before slaughtering, the chickens receive a different, antibiotic-free feed, so that the residue will not be detected by tests" (Ha'aretz, Oct. 2005). Consumers are led to believe that the food they serve is antibiotic-free. Of the millions of kilos of antibiotics that are fed to chickens, only about 20 percent are metabolized; the remaining 80 percent ends up in their feces.11 All of the waste produced by factory farmed animals is usually used to fertilize crops and subsequently ends up leaching into waterways — along with the drugs and bacteria that it contains. While the virus that causes avian flu (H5N1) is carried in the intestines of wild birds with no effect on the hosts, the confining and filthy conditions in which domestic poultry are raised for human consumption has proven to be a breeding ground for the virus. Birds are being slaughtered by the millions in an attempt to contain the disease. Although the World Health Organization says that "human cases of the infection are rare," it is calling for heightened surveillance as the virus spreads among bird populations. In March 2006, avian flu reached Israel. The virus quickly spread among the chickens, turkeys, geese, and ducks on numerous farms. To contain the disease, the government destroyed 1.2 million birds, only a small percentage of whom were actually infected. The primary method used was poisoning the birds' drinking water, which killed them painfully, and then burying them in mass graves. In some locations, the birds were simply buried alive. Later in 2006 and in early 2007, hundreds of thousands of chickens in Israel were infected with Exotic Newcastle disease, a fatal viral infection that affects only birds, and they too were destroyed. 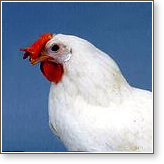 5 S.C. Kestin et al., "Prevalence of Leg Weakness in Broiler Chickens and Its Relationship with Genotype," The Veterinary Record 131(1992): 190-194.